I'm back from the Steven & Chris show and my head is dizzy from all the fabulousness. I've watched the S&C show on TV but seeing it live makes for a much more exciting and fun experience. I loved seeing the set (Lindsay just wrote a great post about it) and watching the five cameras being moved with precision to bring those magic images to your screen. The boys were on top of their game - Chris' funny endearing personality was the perfect complement to Steven's more subdued charms. 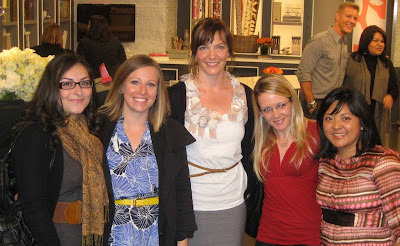 Liz, Shannon, Tara, Kerry, and me. Pic borrowed from Liz. Finally seeing blogger friends in person was great fun. Chris, Tara, Lindsay, Liz, Kerry, Janice, Sharon, Vanessa, and Lisa were all there. I am so glad I got to meet you all! And meeting some new-to-me bloggers like LipstickRules, 7 Dollar Pants, and le Petit Reve was nice too. 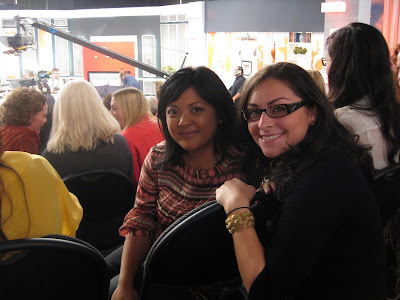 Can I just say that bloggers make the best looking audiences? Because they do. Everyone was so pretty. Speaking of pretty, Jenny McCarthy was a guest on the show and she was stunning, smart, and funny. What a great combination. She talked about everything from buddhism to masturbation bears (you'll have to watch the show to understand that one!). The CBC crew on the show has to be commended. They did a wonderful job of making us feel welcome and appreciated. From encouraging us to take pics and tweet during the breaks, serving up a deelish pulled pork sandwich lunch (courtesy of guest Chef Rodney Bowers), to an intimate Q&A after the show and giveaway bags to take home, it was a great experience. 1. You're not a true blogger unless you have a smartphone. 2. Bloggers can put an outfit together just as well as they can decorate a room. They are a stylish bunch. 3. Its really hard to identify bloggers when you've only ever seen them in their 2"x2" blog profile pic. 4. Steven & Chris are a couple on and off the set. I always kind of wondered. Doesn't mean I'll give up the schoolgirl crush I've had on Steven ever since his CityLine days though. 5. Pulled pork + Dr. Pepper secret sauce = a.w.e.s.o.m.e. Great post and thanks for the link. So great to meet you. If I seemed a little excited it's because I was! I have been reading your blog for awhile and it was so great to meet the creative person behind the words. You'll have to read my post to see how far back Steven, Chris and I go! They are genuine sweet guys and deserve all of their success. I totally agree! We all should have worn name tags or something. Very hard to put a blog with a face, but I had a great time yesterday. Everyone was super nice. It was so great quickly meeting you yesterday! And you're right about trying to identify bloggers! Amazing meeting you yesterday!! It was a really fun show and agreed on all of your points - except you were instantly recognizable! My hubby uses Dr. Pepper (my fave pop, btw) in his rib sauce so if you like ribs, give it a try! Ha! I had such a crush on Steven in his CityLine days was so sad when I found out he was gay - but they're cute together so it's all good ;). Looks like you had fun! It sounds like such a fun day! I can't wait to watch on the 22nd!! Hey Jennifer!! It was such an awesome day and I am so glad we got to meet for the 2nd time and chat!! I must have taken like 300 pictures!! I guess we found out for sure that they are a couple, but I agree a girl can still crush!! LOL, I didn't know that was you! OK, name tags are definitely going to be needed for our meetup! I had such a great time!!! It was hard to seek out bloggers at the show -- so many people!! Sorry, I didn't get a chance to say 'hello'. Lunch was delicious!... can't wait to make it. Wasn't it fabulous Jennifer! And I didn't even realize you were sitting right down the aisle from me! I'm horrible with faces. Hoping we can chat at the meet up! So great to meet you and I'm glad you didn't think I was stalking you. LOL. Looks like you all had a great time. I've not heard of theis show since I am from the states. The set look fab from your pics. I didn't realize you were sitting just down the row from me either! It really was a great event! I would have loved to have been there - but being a west-coast blogger... well, it'd be kinda expensive! ;-) I'm making my way around the blogs with S&C posts and I'm finding that so many of us have little crushes on Steven! HaHa!! They're both such cuties... and such talented designers, too!! You guys are so lucky! This seems like it was a fabulous time!! I love Steven and Chris and I wish I was on the east-coast too! I was so upset not to have made it that day. I was swamped at work and had to cancel. I can't wait to meet you and the other bloggers from Toronto. Ohh, ooohhhh, oohhh! The blogger episode just came on tv! Watching it now! Looking for you in the audience! You look so cute! I'm glad you had a good time and got to meet some of your fellow bloggers.